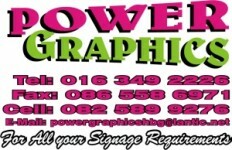 Power Graphics is an independent signage company, established in 1998. We are proud to deliver, hands on service with prompt attention to our customers needs. From a humble beginning of printing imported T-Shirt transfers and vinyl cutting, we now do full color digital printing for Garment printing, Shop fronts, Safety signs, Billboards, Banners and Vehicle Branding. Custom Logo Designs.